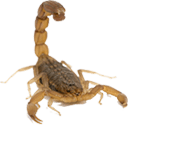 We specialize in the elimination of German Cockroaches in Phoenix, Gilbert, Chandler, Arizona area. German cockroach is a small species of cockroach, typically about 0.4 - 0.6 in length and brown in color. 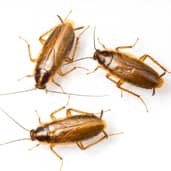 It is the most widely spread cockroach in the world and can be found on every continent except Antarctica. This indoor domiciliary pest has been around since ancient times, which speaks to the resilience and extraordinary adaptivity of the species. German cockroach extermination presents a far greater challenges than that of other cockroach species. Their short reproductive cycle combined with a larger number of eggs produced by one female allows for extremely fast population growth. German cockroaches also reach maturity and, thus, reproductive age much faster than other similar species. Cockroaches survival ability through adaptation and mutation is well known. German cockroaches are adept at developing resistance to current means of pest control. In addition, their small size, nocturnal lifestyle, and preference for confined, dark places, keep them away from human eyes and safe from natural predators. Successful extermination of German cockroach population requires sustained and systematic efforts and involves a number of methods and materials. It is virtually impossible to end a German cockroach infestation without professional help.